We look after the whole A&I Taxis fleet: meeting and exceeding stringent servicing and maintenance requirements. As members of the Good Garage Scheme, whether you’re an account customer or a private client, you can rest assured we’ll give your car the same care and attention backed up with friendly, reliable customer service. 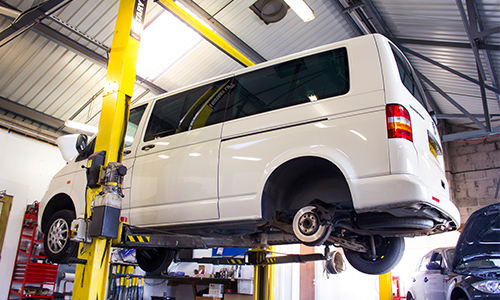 From using the latest technology to carry out annual manufacturer services that comply with your warranty – a cost-effective alternative to dealership garages – to emergency repairs to get you back on the road, your car’s in safe hands. In fact, our two expert mechanics have decades of combined experience. Because we don’t carry out any work without your approval of the estimate, we guarantee you’ll never see a bill you weren’t expecting. And there’s the added convenience of local vehicle pick up and drop off. Every vehicle we service receives a complementary car wash before you pick it up, so it’s in great shape under the bonnet, inside, and out. Drop by and experience an altogether better service.